It perfectly extends iPhone keeping its bestworld-recognized design. We’ve created an accessory that doesn’t change or distort iPhone design. Along with its basic features Aluminium V is a premium class accessory, which perfectly completes and adorns a set of things you carry every day. - Portable Charger with a new and convenient dongle-type connection, exclusively developed for iPhone5S/5 and patented (no wires or bulky cases distorting the beauty of the iPhone). 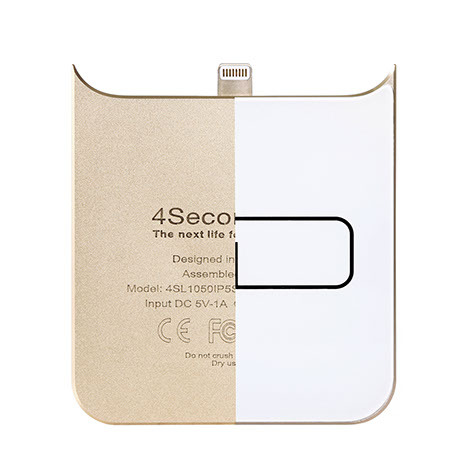 - Rechargeable 1250 Mah battery adds over 70% recharge for iPhone 5s & iPhone 5. - Aluminium V has a built-in touch slider (iPhone users have already got used to and have enjoyed for a long time) to turn the charger on and off. - LED light slide-bar shows remaining battery level.